When it comes to testing, A/B testing typically steals the spotlight, casting its sister procedure, variance testing, in the shadows. However, according to Emily Emmer, Senior Interactive Marketing Manager, Extra Space Storage, that’s a mistake. At MarketingSherpa MarketingExperiments Web Optimization Summit 2014, Emily presented on how her team was able to utilize variance testing to transform Extra Space Storage’s Wild West testing culture into a wildly successful testing environment. Before the team conducted variance testing, the company’s testing environment was structured like a free-for-all. There were few, if any, set rules in place, and, according to Emily, the person with the highest title and the loudest voice typically had their test implemented. All of this changed after the Extra Space Storage team ran some variance tests. 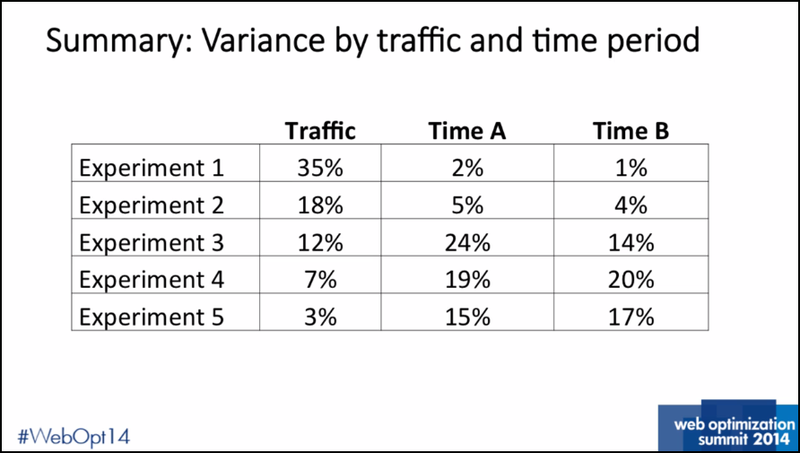 Variance testing measures two identical Web experiences to determine a site or page’s natural variability. This procedure generally constructs the rules for subsequent A/B tests to follow. By focusing on variance testing and translating the results from this procedure into rules for A/B testing, Extra Space Storage achieved a 45% increase in conversion rate from the previous year. Watch the below excerpt to learn the results of the team’s test, the rules they developed and Emily’s advice on when to start variance testing and how to implement it. “So you can see between Experiment 2 and Experiment 3 — really big difference, right? So moving from like a four and five percent difference in conversion rate to like a 24 and 14 percent conversion rate — that was about the breaking point,” Emily explained. Altogether, Emily and her team developed four different testing rules from this effort, including that all tests need to run for at least two weeks. Emily advised anyone who runs or plans on running A/B tests to conduct variance testing beforehand. This will give future tests a baseline for how much of your traffic you can test and still expect to gain workable results.